I'm Having Menopause Symptoms. Who Should I Turn to? Menopause symptoms can have a negative impact on many aspects of your life. Night sweats may cause sleepless nights, hot flashes may make you very uncomfortable, and mood swings could be negatively affecting your relationships with your friends and family. So you may be wondering who you can talk to? Well, continue reading to find out the people in your life who are going to be willing and able to help you. Your friends are no doubt going through the same thing as you. They are suffering from hot flashes, night sweats, and mood swings just like you, so why not commiserate together? There is something very therapeutic about being able to talk about your problems with someone who has gone through the same thing, or who is going through it, too. Being able to talk it out with someone who understands could be more helpful than you know. Although your partner will never go through menopause, he can help you through yours. It is important that you communicate to him what you are going through and what it is like to be suffering from menopause and all the unpleasant symptoms related to it. Keeping the lines of communication open and flowing will help to turn him into an important resource and confidant. 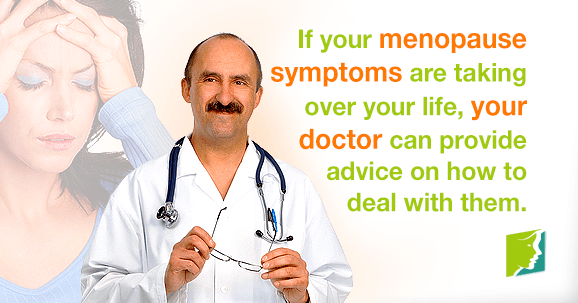 When your menopause symptoms being taking over your life, it means that it is time for you to talk to your doctor. Even if you are not looking for undergo hormone replacement therapy (HRT), your doctor will still be able to give you sound advice about how to deal with your frustrating menopause symptoms. Be sure to do significant research, so that you can explain clearly and concisely what your symptoms are and how you have been dealing with them. The more knowledge you have on the subject, the better your doctor will be able to help you. It is extremely important to know who you can turn to when you need help managing your menopause symptoms. It is also important to understand your menopause symptoms. Click on the link below to find out more about your menopause symptoms.